You need a quality night's sleep every night and that means more than just a comfortable and warm comforter and sheets. You want to make sure you are sleeping on an incredibly comfortable surface. Unfortunately, your mattress may need some help to offer the most comfort to you. With our Serene Foam Mattress Topper, you will feel the difference. With our incredibly comfortable and responsive Serene Foam mattress toppers, you'll receive reduced tossing and turning, greater support, and reduced stress on pressure points, all of which results in a quality night's sleep every night. Tossing and turning throughout the night results in soreness the next day along with disturbed sleep. It can be hard to function the next day when you're not getting a quality night's sleep throughout the whole night. Your mattress may be part of the problem. Your mattress may create uncomfortable pressure points that cause you to move around to alleviate the pressure. 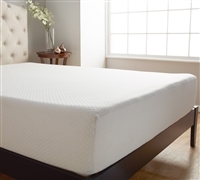 With our Serene Foam Mattress Toppers, you will receive superior comfort with greater support and responsiveness to get a quality night's sleep every night.